Atheist Air Force airman must swear religious oath to reenlist. 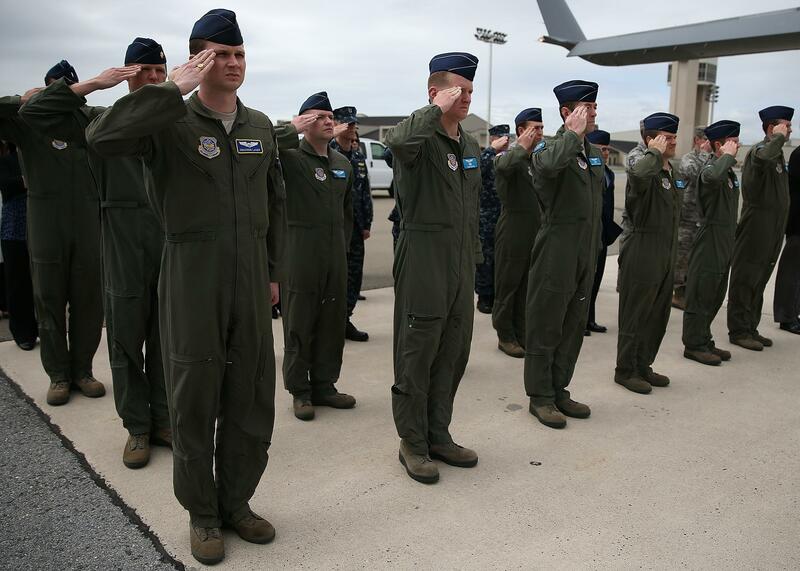 Members of the U.S. Air Force salute at Dover Air Force Base. The airman was told his only options were to sign the religious oath section of the contract without adjustment and recite an oath concluding with “so help me God,” or leave the Air Force, the American Humanist Association [AHA] said. The AHA said that is unconstitutional and unacceptable and that Article VI of the Constitution prohibits requiring religious tests to hold an office or public trust. AHA’s Apignani Humanist Legal Center, said the airman should be given the choice to reenlist by swearing a secular oath. She said the AHA will sue if the airman is not allowed to reenlist. The Air Force used to allow airmen to omit the phrase ‘so help me God’ if they so chose. But an Oct. 30, 2013, update to Air Force Instruction 36-2606, which spells out the active-duty oath of enlistment, dropped that option. Since that quiet update to the AFI, airmen have been required to swear an oath to a deity when they enlist or reenlist… The Air Force said it cannot change its AFI to make “so help me God” optional unless Congress changes the statute mandating the oath.